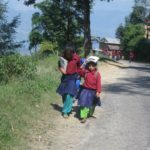 Bruce Keenan, founder of the Himalayan Children’s Charities (HCC) in Nepal, forwarded these letters from college students who recently visited Food for People in the village of Tasarpu, Dhading District, forty kilometers from Kathmandu. The students live in an HCC group home called Kushi Ghar (happy home) while they are attending school. Bruce is a supporter of the Food for People program and a TPRF adviser. He is profiled in a previous blog article posted on July 12, 2012. I was really delighted to go to the FFP mainly because it is far from the crowded city. The other reason is that when I come here, my mind is at peace. I came here two years ago in 2010, and I was really amazed to see everything in the same condition. Nothing had changed. For example, the environment was orderly and clean, the maintenance of the kitchen was spotless, and everything looked perfect. 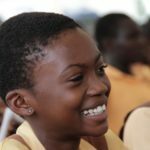 Seeing the kids and the elders enjoying their meal, I really wanted to express my gratitude to all the people who collectively generated ideas for opening this kind of organization. In the future, if I am able to save enough money, I want to open an organization to help poor people and eradicate poverty. I want Food for People to extend its services in areas of Nepal like Humla, Jumla, Solukhumbu, and other remote locations. My happiness knew no bounds when Bruce decided to take us on a trip to the Dhading Food for People a week ago. I was eagerly waiting for that day to come, and on the 6th of October we went. We started our trip at around 6:30 a.m. with fifteen people. We reached our destination at 9:15 a.m. My heart leapt with joy when I got the chance to see the FFP for a second time. The environment was so peaceful and pleasant. I wanted to stay for a week, so that I could help there and learn something new from them. The FFP had its own beautiful and well-managed kitchen garden where there were various vegetables. The kitchen was well managed, neat and clean. 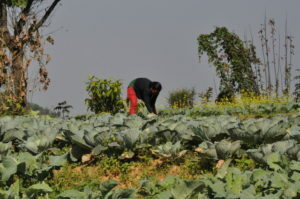 Now I have made a promise to myself that I will plant various vegetables in my kitchen garden and keep my kitchen and store room as I saw it at the FFP. I had visited the FFP three years ago. I was excited to know about our next trip to Dhading. Waking up early at five AM and taking a two hour drive on a bumpy and winding road was a little boring. However, getting out of an overcrowded city with pollution and traffic made me relaxed and happy. We arrived on time, and I started talking to the kids who were there for lunch. We then went inside the kitchen. There were nine staff members doing their duties sincerely. The kids sat on the floor with a TV in front of them. We were taken to see the store and kitchen. I had never seen the system of covering your hair before entering these places. It prevents your hair from falling out into the food. After that we were served tea and biscuits. Then they took us to see a home provided to some staff from the village. Since everyone was hungry, we went for lunch. I must say the food was quite tasty in spite of being cooked in such a large quantity. 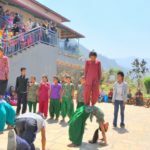 When Dinesh told me we were going to the FFP in Dhading, I thought it would be a general kitchen like a restaurant, serving a different variety of food to many people. We often see kitchens like these in the capital. 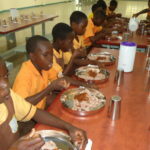 When I reached the FFP, I was so amazed to see a different food kitchen serving many children the same food. Food for People, often called the “Food Kitchen,” is a social organization started by Prem Rawat through Premsagar Foundation Nepal. 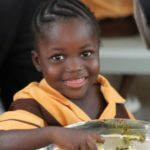 The general objective of Food for People is to serve a healthy meal to poor and underprivileged school children before going to school. 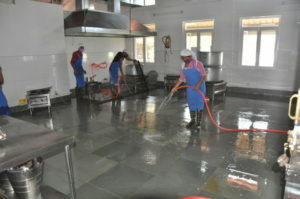 Everyday around three to four hundred people are served by nine staff members. I was really surprised to see how well-managed and clean the food kitchen was as it serves poor and needy people. It made me motivated, and I hope I can do such great work someday for poor and needy people. 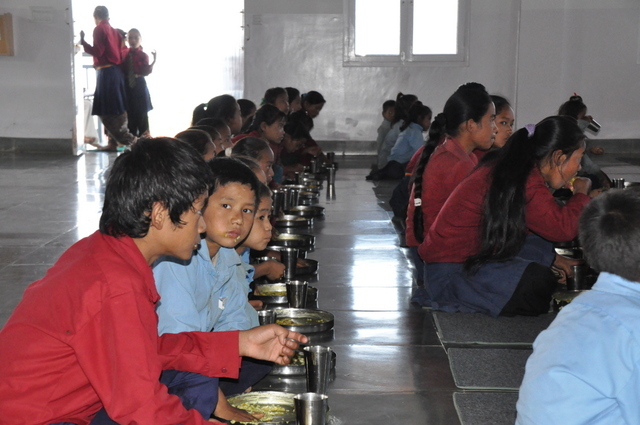 Food for People is the first step in Nepal. Now the time has come to unite the people of Nepal to help our own brothers and sisters. Such a food kitchen or alternative should be opened to rural areas where people are dying of hunger. If we unite and work together nothing is impossible. Lastly, I feel great and lucky visiting such a place. I am very motivated to work for people. I would like to thank everyone for providing me with such an opportunity. 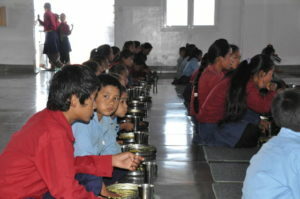 The poor who receive food and education from TPRF have bliss in their life. This is great help. This is a very dignified way of giving food to the poor directly. No middle men pocketing the profits. Thank you dear Prem Rawat for your compassionate soul and for your relentless efforts to help humanity via this organisation and your Words of Peace.